I was using 5 until my toddler made off with them. Now I can’t find more than one at any given time. I just received my (4) dryer balls last week and all that you said is so very true!!!! They are quiet, I have to hunt them down in the clothing, lol…they are wonderful, I hope that they will decrease drying time, I do lots of laundry. 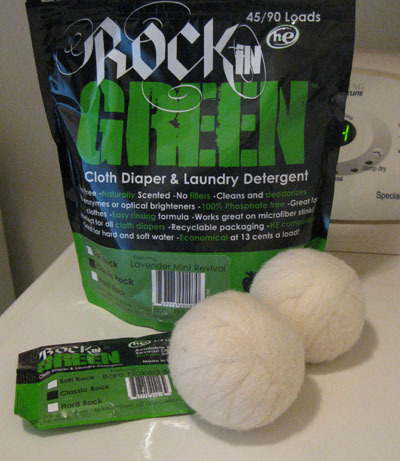 I love the dryer balls from Rockin’ Green’s website too! 🙂 They’re made by the fabulous WAHM behind a brand called Buddha Bunz. If you buy through her website you can even get colored and scented balls. I have 5 Buddha Bunz dryer balls and have noticed a big reduction in dry-time, and I’d eventually like to get a couple more. And I also wanted to chime in and say that the PVC-free dryer balls from Nellie’s did the same thing to me! I went to clean out our lint trap once and found bunches of little “decapitated” green little nubbies in the lint! 🙁 Thankfully they will give a full refund if you email them and tell them that you would like to return them… I did this and used the money to get more wool dryer balls! I have 6 wool dryer balls and I am pretty happy with them. I made my own from a tutorial that I have seen online. Used some coupons for Michaels so they cost very little per a ball and very efficient also very green. It took me only n hour or so to make.I washed and dried on hot with my towels.Since mine is from 100%yarn I did not have that much pilling. @Katie, Thanks. I tried to keep up with all the little comments that kept running through my head about these as I’ve used them over the last few weeks. @Melissa, I ended up taking back the Nellie’s pvc-free dryer ball to the store to get a refund. I wonder what they’re going to do about that product. We can’t be the only ones having trouble. 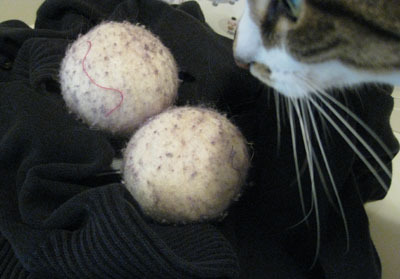 I thought that these wool balls were the same as Buddha Bunz, but they didn’t mention it on the Rockin site. She sells them at a lot of places, right? Have you tried the scented balls from Buddha Bunz? @Esra, I’ve seen those tutorials online. I might get brave one day, but I’d have to lock up my two cats for sure. They’d go nuts if I got out all that yarn. I also have ~12 (4 I purchased and the rest I made myself) so that I don’t have to hunt them down each time. I love them so much I even made a bunch as x-mas gifts. @Stacey, Great idea for Christmas gifts. I might have to try it next year. Here’s my buzzkill question: what makes these dryerballs better than getting balls of large guage wool yarn ourselves from a knitting supply store, boiling the wool balls, drying them at high heat, and then using them? Boiling and then drying at high heat will shrink and compact them, rendering them dense and firm for this purpose. What is the cost of Rockin Green balls? I bought my wool dryer balls at http://www.WoolDryerBalls.com 3 year ago and the same 6 are going around in my dryer right now! We love our dryer balls!